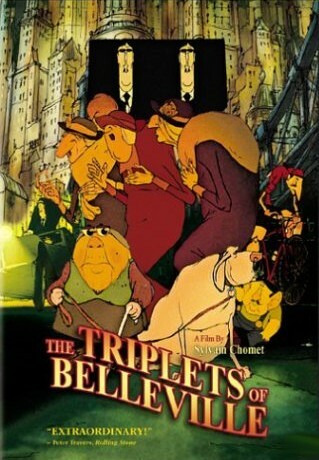 Tomorrow (Tuesday Sept 1st) the theatre on the green at 103 Spring St will screen The Triplets of Belleville at 8:30pm. When her grandson is kidnapped during the Tour de France, Madame Souza and her beloved pooch Bruno team up with the Belleville Sisters–an aged song-and-dance team from the days of Fred Astaire–to rescue him. This film was nominated for two oscars and won a total of 18 awards when it was released in 2003. Reportedly a very funny inventive movie with a fab sound track. Sounds perfect to me for viewing from the beautiful lawn under the stars at 103 Spring, but in this venue any film would be fun. If you have not already caught a film at downtown Charleston’s only outdoor movie theatre then you should definitely check this one out. Even if you are not a fan of french movies, this is more than a theatre, it is an experience! Bring a lawn chair or picnic blanket, last time I brought a bottle of red and some sushi. $10 ticket $5 corking fee, beer and wine sold. Contact Mike @ Eyelevelart.com for more details.